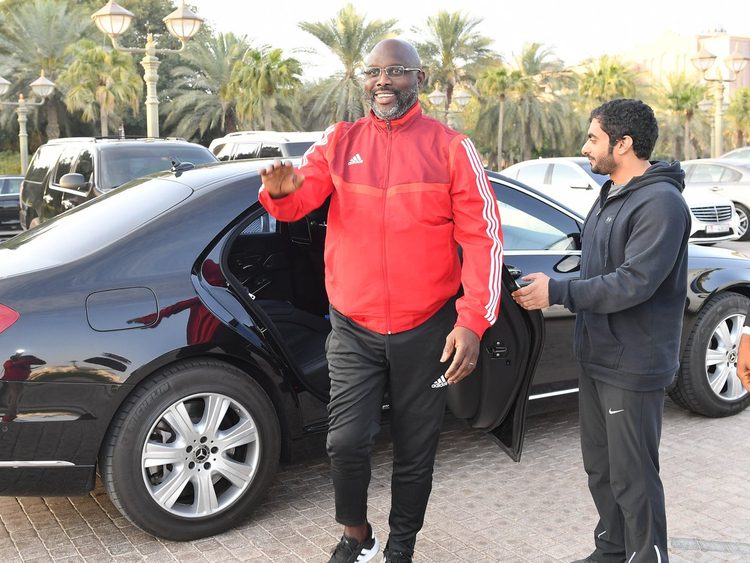 Abu Dhabi: President of Liberia and former footballer George Weah visited his old club Al Jazira on Wednesday and partook in an impromptu training session at Emirates Palace in Abu Dhabi. The 52-year-old 1995 Ballon d’Or and Fifa World Player of the Year award winner assumed office as his country’s head of state last January. He is now in the UAE capital for bilateral talks with Shaikh Mohammad Bin Zayed, Crown Prince of Abu Dhabi and Deputy Supreme Commander of the UAE Armed Forces. During his visit to the Presidential Palace however, he nipped next door to Emirates Palace’s playing fields for a quick kick-about, proving that old habits die hard. The former Monaco and AC Milan star ended his career in the UAE with Al Jazira, scoring eight goals in 13 appearances between 2001 and 2003 before going into politics. Tweets from the club on Wednesday showed President Weah addressing the players before doing some kick-ups and getting involved in a five-a-side where he showed that he still has what it takes to more than hold his own on the football field. “Guys, I’m a former player of Al Jazira,” he told the players in the video. “I’m visiting Abu Dhabi as one of your guests to come speak and train with you.